"Camera, Colors, Cup of Cocoa, Create, Clouds, Car, Complete"
Day 30 of the 30 Paintings in 30 Days challenge and I have "Completed" the challenge! When I decided to do the challenge I chose to work with a theme to give myself some direction. The theme I ended up settling on was -Alliteration in the Titles. So, my paintings had to contain things that started with the same sound. I am glad I chose this theme because I ended up painting a lot of different things that I might not normally paint or paint together in the same painting. The final painting is not really busy, but it ended up with 8 'C' words in the image - Camera, Colors, Cup, Cocoa, Create, Clouds, Car, and Complete. I like how the camera strap feels like a road that the car is traveling on, the colored papers look like colorful fields, and the steam rising from the cup of cocoa could be creating the clouds in the background. I decided to ad an image in the lens of the camera for interest but also to show the Finish Line has been reached or Completed. Thanks for following along on this painting journey! 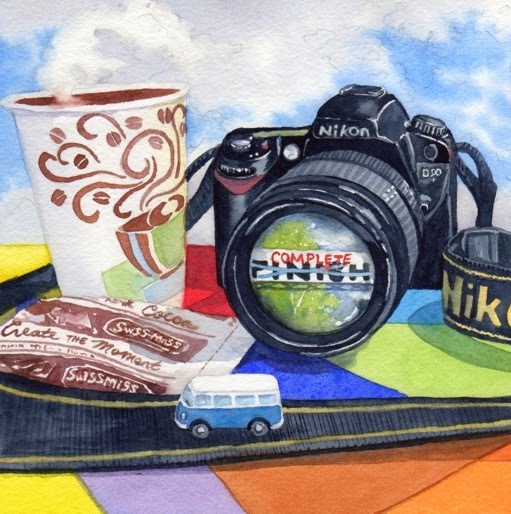 Today's painting "Camera, Colors, Cup of Cocoa, Create, Clouds, Car, and Complete" is a 6"x6" watercolor and it is available on Daily Paintworks for $90. Click here to purchase. Quel talent ! Toutes mes sincères félicitations pour l'ensemble de vos oeuvres réalisées en 30 jours ! Un challenge incroyable. Je suis tellement lente pour créer que je ne m'imagine pas faire un tel défi ! J'aime le choix et la direction choisie pour chacune d'entre elles. Merci . Le défi était plus facile vers la fin . Je peins habituellement lentement , trop , mais je pense que je vais être capable de peindre plus vite maintenant . Merci de suivre le long . Prendre soin . WOW! You did it! 30 paintings in 30 days - what a challenge. And they are all so good - lots of details, bright colors and great compositions. Thanks Margaret. It was a challenge, but a good one. I've not been on the blogs for a while. Facebook seems to be easier to comment and most of use use it. But, while I'm here, I want to compliment you on your 30 beautiful paintings...they were a joy to follow...give you a lot of credit for keeping up with it, especially that yours were quite complex for small paintings. This painting was a wonderful way to end the challenge. Thanks Johanna. Yes, I think Facebook can be easier. The 30 day challenge was tough, but a great learning experience. Thanks for following along.